At Arnold Mill Primary School we take safeguarding very seriously and extend our concerns to the safety of our children when using ICT. The Internet is an invaluable tool for life-long learning and communication, we just have to help our children learn to use this invaluable tool safely. In school, we have regular 'e-safety' activities to remind children of the importance of keeping themselves safe online as well as an e-safety assembly every term. E-safety lies at the heart of our Computing planning and opportunities are built into our teaching time in order to equip children with the relevant skills to deal with any e-safety issues. If you have any questions regarding E-Safety, we would be happy to help. Please come and talk to Mrs Leonard, Mrs Lloyd or Mrs James. We all follow these SMART rules when using technology such as mobile phones, games consoles and home computers. Hector helps the children if they find anything upsetting or disturbing on the computers. He sits in the top right hand corner of the laptop screen and can be clicked on at any time. This then covers the screen with an underwater screen and gives the children chance to tell an adult about the issue. This can then be sorted quickly and effectively by the adult. This website gives you a selection of posters explaining how to keep your child safe on apps and games such as Snapchat, Whatsapp, Minecraft, Roblox and more. This is a good website to explore using the internet safely with your child. There are lots of e-safety activities and resources to explore, all using a child friendly approach. CEOP's Thinkuknow programme provides a range of free educational resources - films, presentations, parental guidance, games and posters. UK Safer Internet Centre is a site where you can find e-safety tips, advice and resources to help children and young people stay safe on the internet. ParentPort is run by the UK’s media regulators. They set and enforce standards across the media to protect children from inappropriate material. 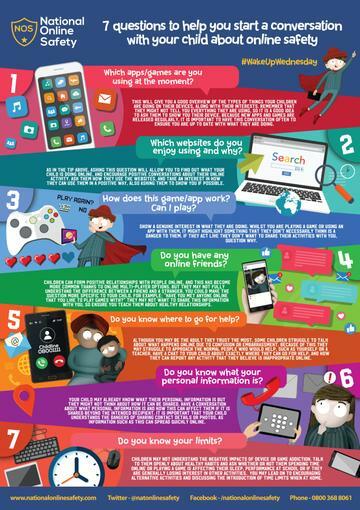 Lots of advice for children and how to stay safe while using the internet. Advice for grown-ups about how they can stay safe online. A charity in the UK established specifically to prevent bullying and child sexual abuse. https://www.saferinternet.org.uk/advice-centre/need-help - Need help? Information about what to do if a child comes to you for help and advice about how to report online concerns such as cyberbullying, inappropriate content or illegal behaviour. https://ceop.police.uk/safety-centre - Child Exploitation and Online Protection (CEOP): A police agency tackling abuse on the internet. This website includes a unique facility that enables parents and young people to make reports of actual or attempted abuse online. https://www.thinkuknow.co.uk - CEOP’s Think U Know website contains information for children and parents, as well as a link for all children to report abuse online. 0808 800 5000 - NSPCC: The NSPCC has partnered with 02 to provide an online safety helpline for parents and carers to answer questions and address concerns about a child’s online safety. www.childline.org.uk – Childline - Children can talk to someone for advice and support at any time by contacting Childline, they can chat to a Counsellor on the phone (0800 1111) or online. www.report-it.org.uk - True Vision: Online content which incites hatred on the grounds of race, religion and sexual orientation can be reported to True Vision; a UK website set up to tackle all forms.